as time goes by there seems to be a growing trend amongst those people lucky enough to afford it / mental enough to spend all available cash on it: home cinemas. huge screens, incredible sound systems and luxurious seats are popping up in seemingly spare rooms and basements larger than my entire flat. however this is also giving a few movie geeks a real chance to shine and it seems they’re not content with a simple in-home movie theatre decent enough to hold a premiere in - they clearly want to be fully immersed in the worlds created by their favourite films. 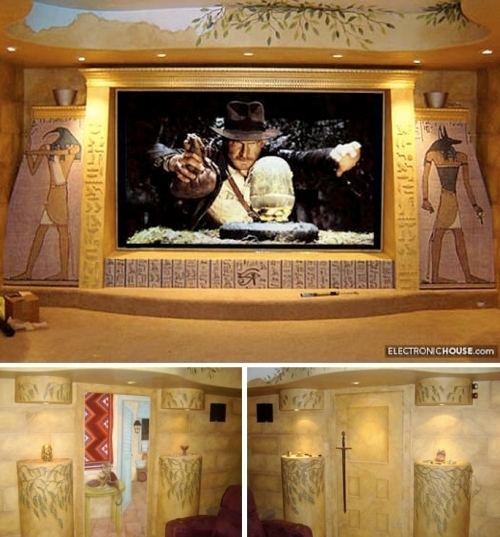 this amazing indy-themed room was designed by home theatre expert doug charrois for larry and colleen halliday in canada. the room even features ‘replicas of the holy grail, a jacket, hat, whips, torches and more—including the idol from the opening of the original movie’. above is possibly the sleekest home theatre i’ve ever seen. 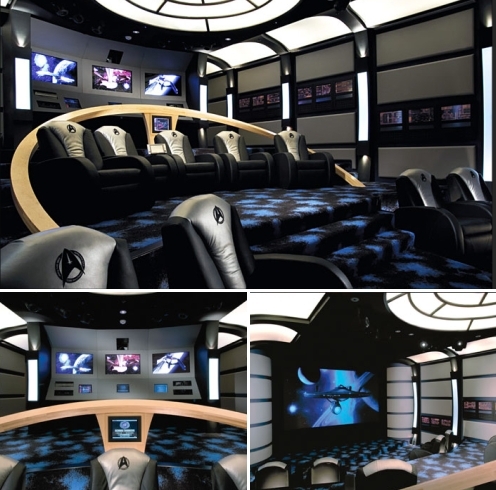 it was created by canadian-based experts ‘elite home theater seating’, who, as the name suggests, specialize in hand-made, custom home theater furniture for ‘high-end’ clientele. and bruce wayne. 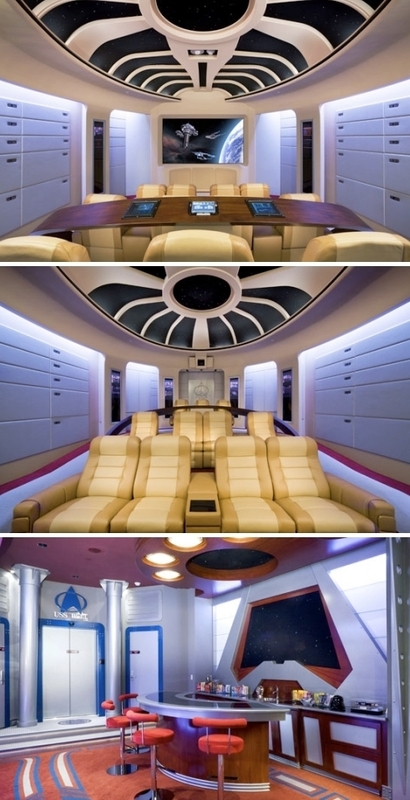 based on starship enterprise ncc-1701d, this stunner consists of a cinema, bar area and apparently ‘one of the largest kaleidoscope hard-drive based storage systems (..) in a residential installation. at last count, there were eight servers with 3,816 dvds’. there’s even a red alert button which brings on red flashing lights and appropriately tense music. 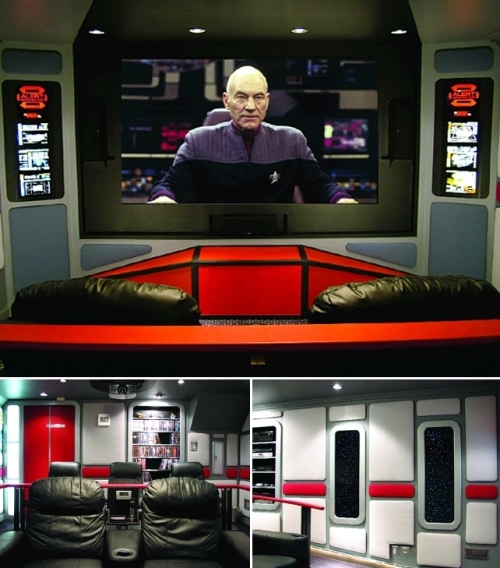 trekkie gary reighn decided to cut out the middle man and design & build his home cinema himself on a relatively small budget of $15′000. 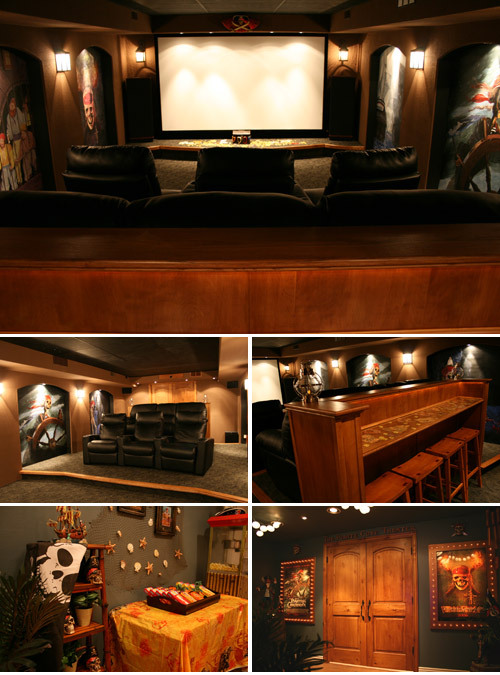 his basement was cleared to make way for the creation and from start to finish took 2 years. 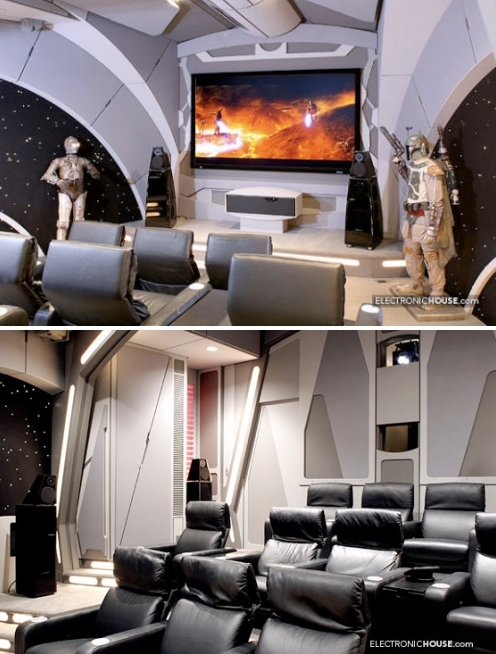 apparently ‘one of the most technically and structurally advanced private theaters in the united states’, this phenomenal star trek home cinema even contains motorised sliding doors, as requested by the unbelievably rich client who paid around $3′000′000 in total for the transformation. 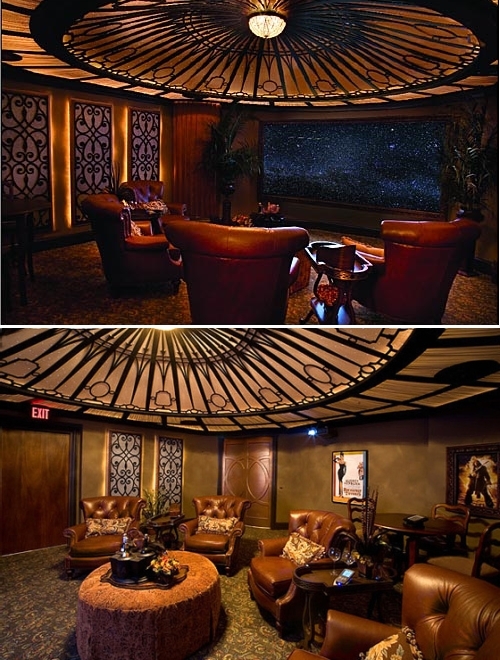 the ceiling dome in this titanic themed set-up contains 1′230 fiber optic light strands in order to provide the artificial night sky and entry to the luxurious bar next door can be found behind a motorised bookcase. the whole project was designed by donny hackett of ‘casa cinema design’. it doesn’t get much cooler than this. 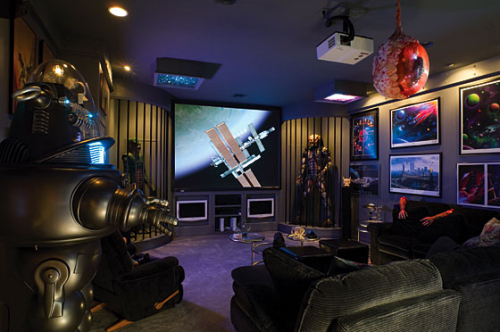 the 10-seat death star home cinema was designed for vic wertz and lisa stevens and includes, amongst other things: automatic doors, a twinkling fiber optic star field and a thx sound system. the best fact? the room was designed by doug chiang, lead designer on episodes I & II. 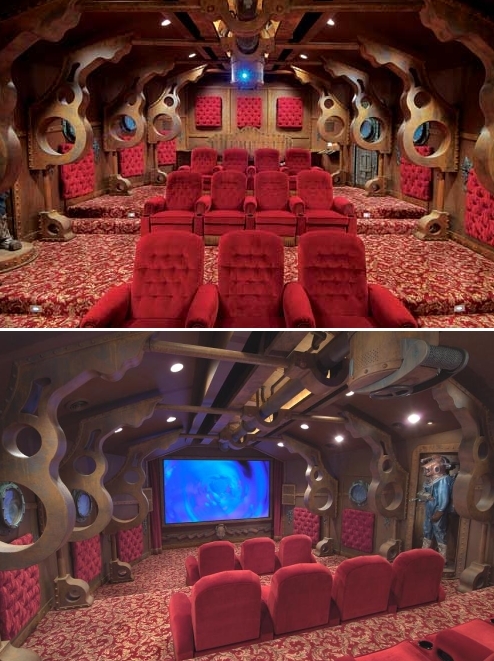 this beauty was built as a result of film geek randy moran’s love of the nautilus submarine from the film 20′000 leagues under the sea. he hired ‘dillon works inc’ to build and fabricate all the trusses, wall panels, screen frames, and portholes and ‘acoustic innovations’ to supply the plush red seating. the pirate cove was created as a result of avs forum user pkonold’s love of the pirates of the carribean disney ride and movies. to make the atmosphere as authentic as possible he and his wife ensured that when seated ‘you feel like you are floating down “the bayou” at night. to accomplish this we have built a star field in the ceiling, complete with real constellations and shooting stars!’. ok, so the screen isn’t the biggest and the seats are slightly lacking but inside dr. david winn’s home cinema can be found: a hydraulic alien bursting through the wall, a talking robbie the robot and both the predator and the creature from the black lagoon behind bars. 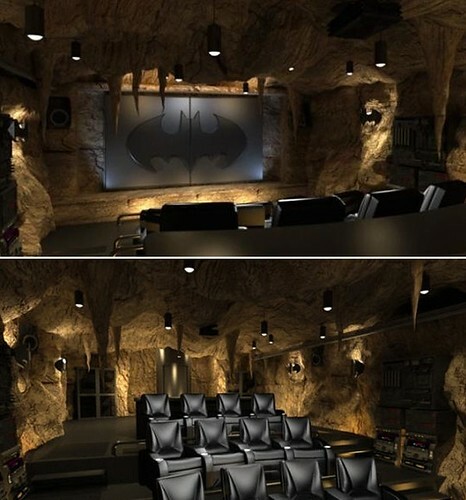 the cinema, including all collectibles, cost approximately $100′000. Rogue Trader costs Societe Generale 7 Billion!! Massive fraud by a rogue trader at Societe Generale SA has led to a €4.9 billion ($7.16 billion) write-down and is roiling markets as far away as Asia and further shaking investor confidence in Europe's biggest banks. The bank, France's second largest after BNP Paribas SA, revealed early Thursday that it had detected a case of "exceptional fraud" due to a single trader who had concealed enormous losses through a scheme of "elaborate fictitious transactions." The bank identified the trader as Jerome Kerviel. Mr. Kerviel, 31, joined Societe Generale in August 2000 and was working as a trader on the futures desk at the bank's headquarter near Paris. He was in charge of futures hedging on European equity market indices, known as "plain vanilla" futures. The bank said he was able to dupe the bank's own security system because he had inside knowledge of the control procedures gained from previous jobs with the bank. Though Societe Generale says it first learned of what it termed "massive fraudulent directional positions" on Jan. 19, it waited until it could close out those trades before going public with the problem. Winding down the trades, the bank said, resulted in a €4.9 billion write-down, making it potentially the largest loss ever from an alleged rogue trader. At a press conference, Chief Executive Daniel Bouton apologized to shareholders and said the bank wouldn't offer staff stock options or bonuses for 2007. Neither Mr. Bouton nor co-CEO Philippe Citerne will take a fixed salary through June, he said. The size of the SocGen incident could far surpass one of the most notorious "rogue trader" incidents in global corporate history, the more than $1.3 billion attributed to Nick Leeson in 1995 which bankrupted British bank Barings. Barings collapsed after Mr. Leeson, the bank's Singapore general manager of futures trading, lost £860 million pounds -- then worth $1.38 billion -- on Asian futures markets, wiping out the bank's cash reserves. The company had been in business for more than 230 years. As a proof of concept, the General Atomics maglev is impressive, but to fully grasp the potential of high-speed trains in this country, you still have to use your imagination. Here’s how it could work: You board a train in downtown Anaheim, Calif., at 5:30 on a Friday evening, destined for Las Vegas. Instead of inching out of the traffic-choked Los Angeles metro area on what is typically a 4- to 6-hour drive, or gambling that the 1-hour, 15-minute flight will depart on time, you glide out of the city, accelerating toward Barstow. As the train fires through the Mojave Desert, it hits a top speed of more than 300 mph, and then pulls into Vegas just 90 minutes after departure—in time for dinner before an 8:00 show. That scenario won’t come to pass for years, but commercial high-speed train travel is no mere fantasy. In other countries, “steel-wheel” bullet trains have been in operation since the 1960s. Japan’s Shinkansen sails along the 645-mile route between Tokyo and Fukuoka at up to 186 mph. In France, the high-speed TGV tops out at 199 mph on the 480-mile run between Paris and Marseille, which takes 3 hours. Within the U.S., Amtrak’s seven-year-old Acela Express can reach speeds of up to 150 mph, although the tight curves and dangerous roadway crossings of the Northeast Corridor route curtail its average speed to 86 mph. Magnetic levitation, the technology floating the test train at General Atomics, has a smaller commercial footprint, but it has the most impressive capabilities in the world of superspeedy trains. A maglev train that began service four years ago in Shanghai runs 20 miles between Pudong International Airport and the city’s business district in just 8 minutes at speeds of up to 267 mph. And this past September, the city of Munich, Germany, announced plans to build a new maglev line that will cover the 25-mile route between Franz Joseph Strauss International Airport and downtown in 10 minutes. Personally I loved the G4 cube with its vertical loading optical drive and clear case. I will try to look around for one as a nice collectors item. Scientists at a British biotech company said they have evidence that their genetically modified mosquitoes, which are programmed for sudden, early death, can control the spread of dengue fever. Dengue is carried by mosquitoes and is the scourge of urban areas in the developing world, much as malaria is in rural regions. The company, Oxitec, said it can decimate mosquito populations by breeding genetically modified male mosquitoes, then releasing them to mate with wild females. Their offspring contain lethal genes that kill them young, before they can reproduce. Company officials told Wired News that their latest test results show that the genetically modified bugs can breed just as well as wild ones. "We will be able to control dengue through controlling the mosquitoes that transmit it, especially in large urban areas," said the company's chief scientist Luke Alphey. "Thereby protecting many, many millions of people from this disease." Mosquitoes pass dengue fever to up to 100 million people each year, according to the Centers for Disease Control and Prevention. Up to 5 million die. If the scientists can replicate their results in real field conditions, their technology could kill half of the next generation of dengue mosquitoes, which scientists say would significantly reduce the spread of the disease. If all goes well the company envisions releasing the insects in Malaysia on a large scale in three years.